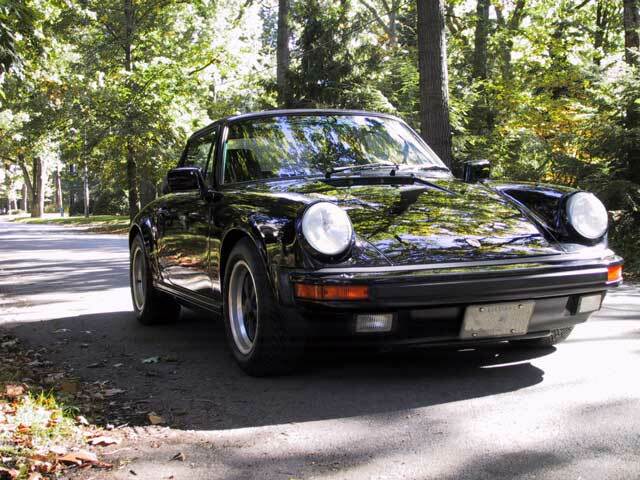 My Porsche story goes back to 1972 when my Dad was shopping for a new family car. We visited the Volkswagen showroom where I got my first up-close look at a Porsche, the 914. I thought that car was very cool but despite my urgings, Dad bought a VW 412 station wagon. At least it had a Porsche engine. Apparently, people collect these things. People are strange. Click here if you want to read about them. Since then, I've coveted the Porsche marque with my tastes leaning towards the 911, especially the Turbo and cabriolet models. Fast forward 28 years when I have the means and motivation to buy a sports car. I had a lot of trouble finding just the right Porsche. I guess I'm a bit picky. I looked at several but either found them over-priced or under-serviced. So, when I found an mint condition 1990 Alfa Romeo Spider convertible, I bought it instead. A great fun car even if it's not Porsche. A great fun car. Very reliable and you can get a set of golf clubs in the trunk. I was pretty happy with the Alfa and invested $4,000 that summer getting the car just right. New stainless steel exhaust, tires, suspension work and many adjustments and tinkering with the timing. I intended on keeping the Alfa for a long time but in April of 2001, I was flipping through the Globe and Mail over my morning coffee and what do you know there's a 1988 Porsche 911 cabriolet advertised. After a few phone calls and emails, I'm convinced this is the right car. Two days later, I flew to Montreal where I had the car inspected. A quick stop at the bank for a certified cheque, a visit to Le ministère des Transports du Québec for a temporary permit and I was on my way down the 401 for the most enjoyable 4.5 hour drive of my life. A new mistress. Faster, meaner and fits the kids in the back. As for the Alfa, I sold it in 3 days at only a slight loss. It was in superb shape with only 48,000kms. The buyer left with a gigantic smile on his face. It was a great car and someday I will own another one. If you have any of this stuff, let me know. Meanwhile, check out the great photos from the Toronto Beer, Wings and Flat Sixes Night.